A standoff with the GPS industry has become a major obstacle to LightSquared's plan to launch a fifth nationwide wireless carrier. NEW YORK (CNNMoney) -- LightSquared's plan to become a fifth major nationwide wireless carrier hit a major snag this week, after government regulators said they would continue to bar the company from launching its network. The National Telecommunications and Information Administration said late Tuesday that LightSquared's network could interfere with GPS signals, despite LightSquared's proposed engineering solutions. That interference has the potential to be extremely dangerous: In addition to powering consumer navigation devices, GPS is used by the military and the aviation industry to guide airplanes and missiles. As a result of NTIA's decision, the Federal Communications Commission revoked a waiver that would have allowed LightSquared to turn on its network. The FCC on Wednesday plans to issue a public proposal that would bar LightSquared from launching its service "indefinitely." LightSquared wants to sell wireless on a wholesale basis, a move that would potentially add dozens of rivals to AT&T (T, Fortune 500), Verizon (VZ, Fortune 500), Sprint (S, Fortune 500) and T-Mobile to the mix. Since the company only plans to launch efficient, next-generation network technology, it believes that it can severely undercut the current national carriers' prices. The wannabe wireless company, owned by Philip Falcone's Harbinger Capital Partners hedge fund, remains adamant that its technological solutions to the interference issues are valid and resolve the problem. "The NTIA's recommendation relied on the flawed conclusions ... about LightSquared's potential impact on GPS," a company spokeswoman said Tuesday in a prepared statement. "LightSquared recognizes, however, that this is just one step in the process, and it remains committed to working toward a resolution." The problem stems from the fact that LightSquared's spectrum -- the airwaves that are used to broadcast wireless signals -- is directly adjacent to the GPS industry's spectrum. As it turns out, the GPS companies have been jumping the fence for years, picking up signals transmitted through their neighbors' property. It had gone unnoticed, since LightSquared and its predecessors hadn't been using the spectrum until recently. GPS giants Trimble Navigation (TRMB) and Garmin (GRMN) said in response that their systems were never intended to be immune from strong signals on nearby frequencies. They have a point: The spectrum LightSquared owns was originally licensed only for satellite services, not the much stronger terrestrial transmissions LightSquared wants to put there. To do that, LightSquared needs FCC permission. The agency granted its conditional waiver last year. The FCC's technical staff expressed surprise when the issue later blew up into a major controversy with GPS device manufacturers. But after experimenting with several potential solutions, the agency now says it sees no quick fix. And although the interference issues aren't LightSquared's fault, the FCC said its hands are tied. LightSquared has made many concessions in its attempt to gain regulatory approval, including limiting itself to broadcasting in just half of the spectrum band that it had licensed. 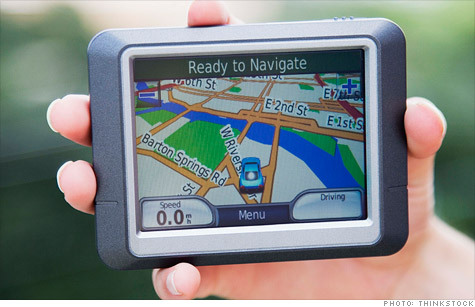 In its view, regulators are coddling the GPS industry. "GPS in America has become 'too big to fail,'" Jeff Carlisle, head of LightSquared's regulatory affairs, wrote in a blog post this week. "Like Wall Street, the manufacturers of GPS devices have spent years profiting off of vulnerable technology and are now seeking protection from the government instead of implementing the necessary reforms." -CNN's Paul Courson in Washington contributed to this report. Here's your iPhone. Want service with that?